I had one of those rare and amazing nights last night. You know those Saturday nights where you have absolutely nothing on – nothing at all that requires putting a face and clothes and shoes on and walking out the door. Things were already looking up. Rare yes, but amazing why? Because I did everything and nothing! I put on two loads of washing (and cleaned the lint out of the dryer)… I changed the sheets… I opened weeks worth of mail… I paid bills… I wrote a grocery shopping list… I sorted the odd socks in my over-stuffed underwear draw… I emptied my wallet of bits of old paper and receipts… I tore out recipes from past issues of Gourmet Traveller and Delicious magazines… and I made a big pot of chicken soup. To you, this may sound like a terribly dull way for a 32-year-old woman to be spending her Saturday night, but to me, it was such a pleasure to just find this ‘time’, for everything and nothing. I’ve taken on the occupational hazard of being a organised person, so restoring this mundane order – in my terribly unbalanced and busy world – was bliss (the wine and dark chocolate helped of course). If this sounds like far too much excitement for your Saturday night and you’ve already fallen asleep, I don’t blame you – because it had the same effect on me. I was tucked up in bed with a cup of sleepy tea by 9pm and I even managed to read some of a non-food-related book – it may have only been a few pages that I could get through, but I’ll take anything. So while all this wild activity was taking place, a pot of chicken soup was slowly bubbling away on the stove top, steaming up the windows and filling the house with the most restorative and comforting of smells. The rain bucketed down, washing away the chaos and aiding this cleansing mood I found myself in. It’s my combination chicken and vegetable soup because it takes inspiration from an old favourite, Fennel Brodo, and the rest is a bit make-it-up-as-you-go. 23 Jun	This entry was published on June 23, 2013 at 8:57 pm. 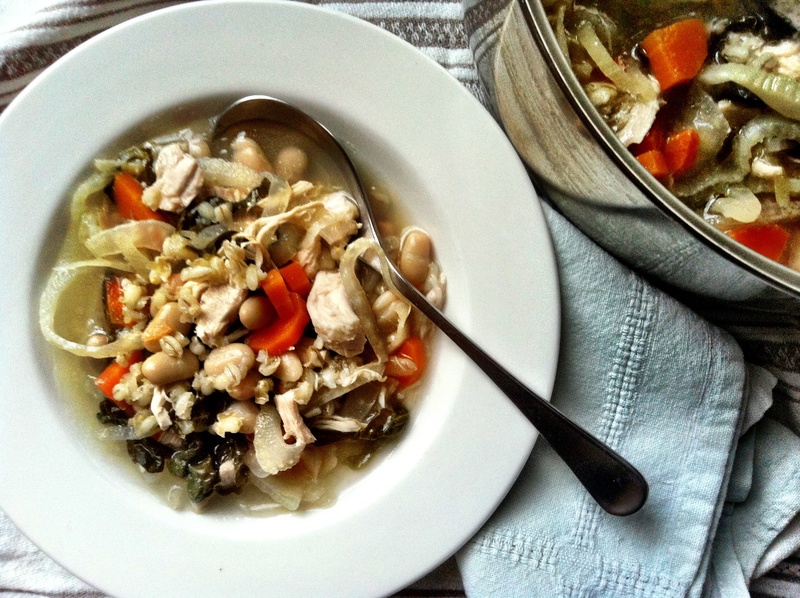 It’s filed under Delicious and healthy!, Lucy's plate, Recipes and tagged Barley, Chicken, Soup, Vegetables. Bookmark the permalink. Follow any comments here with the RSS feed for this post. Lucy this sounds like a perfect night! And rain to boot. We are just getting going on summer here, but as soon as we have even a hint of chill, I can’t wait to spend an evening with your soup recipe and (hopefully) your inspired organizational energy. I feel more relaxed just imagining it! Im cooking this on Sunday! I do not think thats a “dull” to spend your time!